Models are masters of the two Cs: comfort and cool. Between endless fittings, being sewn into garments, and painful heels often in a size too small, when runway regulars are not at work, they simply want to be comfortable. And clearly, looking stylish is a non-negotiable. These two qualities make MODs the ideal style icons for lazy girls everywhere, which is why we rounded up the best tips and inspiring outfits to craft your own effortless off-duty look. Click through to start channeling your inner Delevingne on the double. Tip 1: Put Your Name On It. The monogramming trend has been spotted on models galore (and will only keep going, thanks to the monogrammed jackets spotted on Rag & Bone’s F/W 14 show). Make like Sam Rollinson and add your moniker to a bomber jacket for a downtown look. Topshop Jersey Jacquard Bomber Jacket ($100) ?? Tip 2: Layer Like You Mean It. If Anja Rubik managed to get an impressive four layers into her spring ensemble, we can at least swing three. Sheer pieces like Rubik’s mesh top and tasseled vest are key for a slim silhouette. Tip 3: Master The Undone Cuff. It’s all about the half cuff (tutorial here). Follow Ava Smith’s lead by leaving one side undone for an unstudied flair. Tip 4: Mix Prints Like You Don’t Care. We know it’s hard to throw ingrained matchy-matchy tendencies out the window, but how awesome does Cara Delevingne look in her mash-up of four prints? Tip 5: Basics Look Best. You likely already have everything you need for MOD style in your closet. Just throw an army jacket over a classic tee, and go! Tip 6: Dr. Martens Are Your Friend. The signature chunky shoes are an easy way to add a punk touch to your outfit. Opt for the oxford version like Tilda Lindstam if the boots are a bit extreme for your taste. Tip 7: When In Doubt: Go For An Edgy + Alluring Combo. If the tomboy looks aren’t your speed, opt for a flirty combination of leather and a miniskirt like Joan Smalls. Tip 8: Never Get Too Girly. 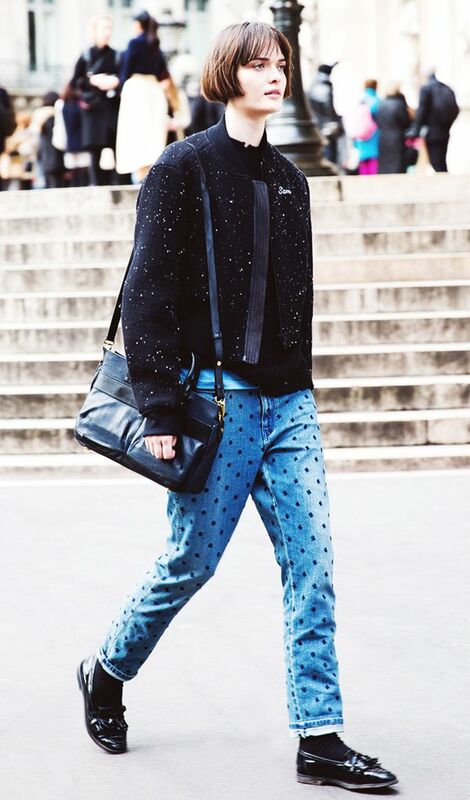 Even in a skirt and heels, Ming Xi keeps her cool-girl persona with a graphic sweatshirt and quirky socks. Tip 9: Live In Your Cropped Skinny Jeans. Showing off a sliver of ankle like Laura Love is a surefire way to lengthen your legs. Tip 10: Comfort Is King. Ji Hye Park knows a thing or two about looking stylish and relaxed. Her outfit of choice? Overalls, of course. Tip 11: Keep Stylish Company. Model pals Tilda Lindstam and Julia Nobis look absolutely adorable in their matching sneakers. Tip 12: A Statement Coat Is All You Need. As Sasha Luz proved, it doesn’t really matter what you’re wearing underneath as long as you have a killer coat. Tip 13: Try Eveningwear For Day. Who says you have to wait for an invite to a Great Gatsby-themed party to break out your flapper dress? Just pair with ankle boots like Grace Mahary for a daytime spin. Tip 14: Default Footwear = Flat Ankle Boots. There’s a reason models have adopted the boot as their signature shoe—it’s as comfortable as it is cool.